The percentage of graduating students in both the district and the state has jumped substantially over the past six years, but because the formula for calculating those numbers keeps changing it’s impossible to do a meaningful comparison. They’re a point of pride for the Clark County School District and the state — and on the surface rightfully so. The percentage of graduating students has jumped substantially over the past six years, from 59 percent in 2011 to 83 percent in 2017. The state Department of Education also highlights Nevada’s graduation rate as among the fastest improving in the nation. It’s great news. But in the background, there’s a nagging voice asking are the numbers inflated? Are they even real? It’s not a question of whether the numbers are flat-out falsified. It’s whether there is any academic improvement behind them. Students were required to pass proficiency exams through the Class of 2016, when a new law eliminated them and replaced them with end-of-course exams. But again in 2017, legislation removed the requirement for students to actually pass those exams. Instead, they become a percentage of the student’s overall grade in the course — carrying no weight for the Class of 2018, 10 percent for the Class of 2019, 15 for percent for 2020 and 20 percent for 2021 and beyond. 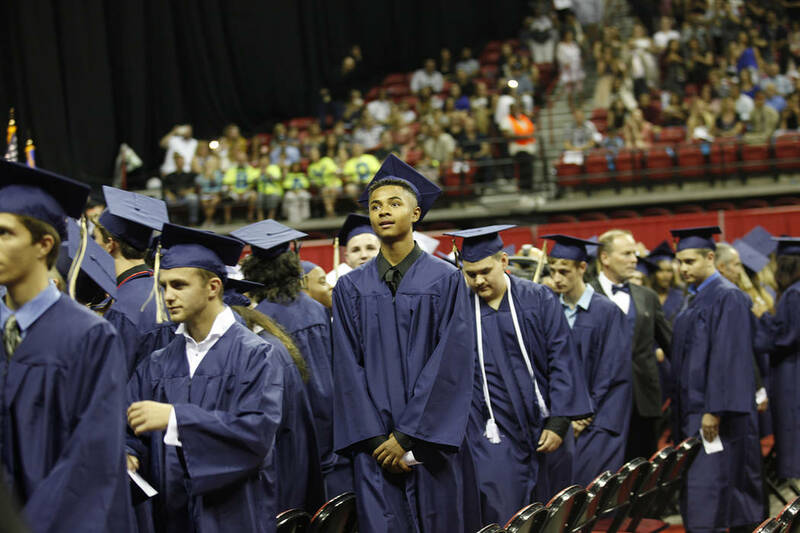 The graduation rate increased noticeably at the same time as the latest change, jumping from roughly 75 percent to 83 percent in the first year. The rapidly changing requirements make it impossible to do a meaningful comparison across years, said Kenneth Retzl, director of education policy for the Guinn Center. And there could be other factors beyond testing. The number of courses taken through the online Apex platform has increased, for example. Exam answers to some of those courses may be searchable online. A number of schools also have adopted some version of a “minimum F” policy, in which a grade of zero is automatically bumped up to a 50. There’s no hard data that could prove these factors are boosting graduation rates. And the Data Insight Partners firm, founded by two former district employees who worked in accountability, offers some evidence that the numbers are solid and are tied to increasing academic achievement. Their analysis of graduation and National Assessment of Educational Progress testing data found that NAEP scores have increased along with graduation rates in recent. In fact, Nevada had the fifth-largest gain in eighth-grade math scores in the country and the second-largest gain in reading from 2007 to 2013, they note. “Regardless of any changes in high school requirements or any of that, these are other pieces of evidence that confirm, yeah, things were improving,” said co-founder Nathan Trenholm. The firm also points out that the percentages of public high school graduates earning a passing grade on an Advanced Placement exam or earning advanced diplomas have both risen in recent years. They also shared this little-known fact: From 2012 to 2013, the graduation rate jumped an astonishing 10 points. That’s because the state reporting requirements changed and administrators began tracking students who moved away in order to remove them from their graduation rate calculation. So what’s the final verdict on our rising rates? You can cherry-pick the data to make either point, but both Retzl and Data Insight Partners view the increase from a positive perspective: as the result of removing barriers to graduation, not a matter of fraud.